Select an event below to start your application. To learn more about each program, please visit the Picademy United Kingdom and Picademy North America webpages. More Picademy UK 2019 events will be announced throughout the year. Sign up for our newsletter to receive the application announcement. In the meantime, please also check out our online training courses to start your learning with us. 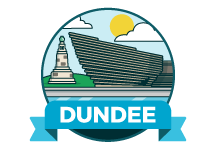 Join us at the incredible V&A Dundee - Scotland’s first design museum. Spend 2 days developing and applying your digital making skills. The Raspberry Pi Foundation's professional development program.